We had a play date with Ebi-kun's favorite friends from yochien. In his 'posse' one of the boys was a bit of a bully so the others wanted to have a play date without him. We met at the little shopping centre at the food court for lunch, Ebi-kun snubbed all the junk food and asked to go to the supermarket for onigiri (rice ball) and salad, that's my boy! I thought he might want to have the same as his friends and I am not that health conscious, it would have been fine if he had asked for a burger and chips but he really didn't want one! 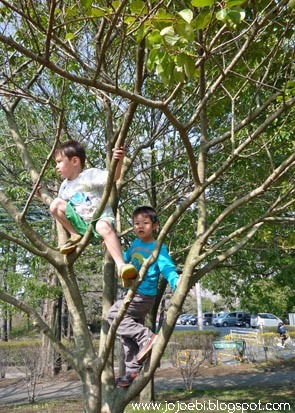 After we went to the park and the boys spent hours running around playing one game or another, looking for treasure, climbing trees and catching 'baddies'. It was lovely weather and great that the kids played for such a long time with nothing but a stick each and their imagination. They then came round to our house for a couple of hours so it really was a full day, they didn't leave until after 6pm but which time my head was ready tom implode - not with the boys but with having to use Japanese all day with the moms. Today, I was planning to go and buy some fabric for a job BUT we have had a severe weather warning and people have been advised to leave work early! That must be a first in Japan, so fabric shopping has been postponed. Looks like a day of finishing off all the school stuff, dying eggs for the egg hunt and maybe a movie this afternoon.